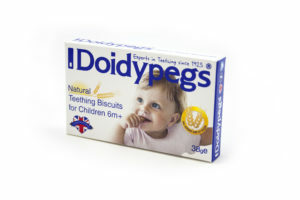 DOIDYPEGS TEETHING BISCUITS FOR BABIES have been a firm British favourite since 1925. They have been used successfully by five generations of babies to cut their first teeth. Unique, all natural and handcrafted to this day in a purpose built bakery in Scotland using only the finest ingredients. DESIGNED FOR TEETHING –Doidypegs are specially designed and shaped to assist infants with the teething process and provide the correct exercise vital to the development of a baby’s jaw muscles, teeth and chewing skills. The shape is designed to allow baby to bite at both the front and back of the mouth, whilst developing chewing skills essential for moving to solid foods. These classic teething biscuits are specially baked for hardness in order to provide a strong surface which allows new teeth to ‘cut’ through the gums. By satisfying the emerging teeth it helps to ease the pain associated with the teething process and some professionals believe that chewing on the biscuits prior to teething helps teeth grow straighter and with better spacing. 100% NATURAL – Whilst Doidypegs are not designed as a food the ingredients are all natural and contain NO artificial colourings, preservatives or flavourings as well as NO added sugar or salt, so you can have peace of mind if your child does eat some of the biscuits. HANDCRAFTED – Doidypegs are still hand-made daily in our dedicated bakery in Scotland. SUITABILITY – Doidypegs can be used by children when they are approaching teething age which tends to be around 6 months, but this varies greatly from child to child. The ingredients used in the product make the Doidypegs suitable for both Vegetarians and Vegans and are GM and dairy-free. QUALITY & SAFETY – Every Doidypeg is hand made using the finest quality Wheatflour and Wheatgerm. They are hand-packed and throughout the production process are put through no less than four rigorous visual and physical checks to ensure the product going out to stores is of the best quality. Each packet of Doidypegs is sealed for freshness in clear foil and they come with safety ribbon allowing you to attach the ‘Peg’ to clothing for safety. Nutritional Information per 100g – Energy 1591kJ/376kcal, Fat 2.7g, Saturates 0.5g, Carbohydrates 81.6g, Sugars 3.5g, Protein 2.7g, Salt <0.03g. AVAILABILITY Overseas – We have Doidypegs distributors/resellers in the following countries: China, Hong Kong RECOMMENDATION – Health Professionals including Doctors, Dentists, Health Visitors, Dietitians and Midwives endorse the product due in part to fact that they are natural with a long history but primarily because they have seen such positive examples of where children have benefited from using Doidypegs. Check each Doidypeg to ensure it hasn’t been damaged in transit. Thread the ribbon through the hole and attach to baby’s clothes – never around the neck. Do not dip in any liquid or sweetener. You may wish to hold the Doidypeg for your baby to gnaw. Give your baby no more than 20 minutes with a Doidypeg and then discard it. Please do not keep and re-use after it has been in baby’s mouth. Never leave a baby unattended whilst using a Doidypeg or any food. Once opened always keep unused Doidypegs in a sealed airtight container. Introduce your baby to cleaning their teeth and good oral hygiene with Doidypegs Finger Toothbrush and Gum Massager. Gentle and easy to use the double sided silicone brush is perfect for softly cleansing first teeth, whilst the dimpled side offers soothing relief to delicate teething gums. The Doidypegs Finger Toothbrush and Gum Massager comes in a handy pack containing two silicone brushes. With clean hands, fit brush & gum massager over an adult’s index finger. Moisten the brush with clean water and gently rub the teeth and gums at the front and back of baby’s mouth. Read the in pack leaflet before use and keep out of reach of infants.